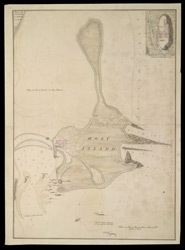 A coloured plan of Holy Island, with the soundings on the coast, drawn in about 1725. Holy Island, or Lindisfarne as it was anciently known, was an outpost of Northumbria. It is joined to the mainland by a causeway during low tide, and becomes an island at high tide. It was known as the centre of an important Anglo-Saxon monastic community and for its connections with St Cuthbert. It is also known for a ruined Norman Benedictine Priory which was built at the same time and in a similar style to Durham Cathedral. Lindisfarne Castle is a small fort built by the Crown in 1549-50. There was still a garrison here until 1819; after this the castle fell into disuse. In 1902 the castle was bought by Edward Hudson, the founder of Country Life magazine, and he employed Sir Edwin Lutyens to restore and improve the fortress.